The RICHTER Piezo Preamp is a unique circuit featuring dedicated channels for EACH string of your bass or guitar. Every channel includes an independent volume trim pot. This allows precise, independently adjustment and balance of your instrument from string to string. The following master volume trimmer provides for an overall output adjustment. The Piezo Preamp superior tone and ultra low noise is not only achieved through careful circuit design and attention to detail - but also through selection of finest components available. High definition amplifier design results in precise and smooth sound reproduction without signal losses. 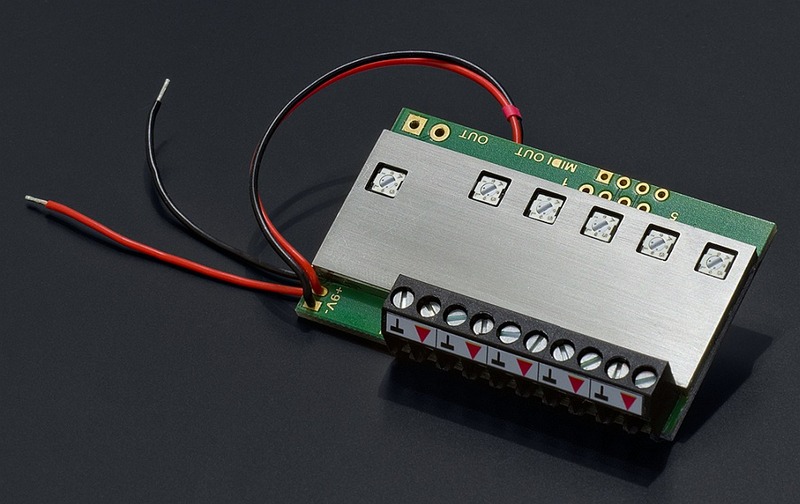 Discrete class A input sections with hand selected and matched FETs. 0,1% precision metal film resistors in the signal path with a resultant noise factor of up to 10 times lower than standard thick film resistors. Low tolerance film capacitors featuring lowest distortion and superior linearity. Highest quality available trimmer pots. Completely shielded and encapsulated - no shielding inside the instrument is required. Installation of the RICHTER Piezo Preamp will require some basic soldering skills. Each piezo sensor from the bridge will need to be connected to its corresponding input channel at the preamp. Instead of not being difficult, professional installation is recommended. NOTE: Excessive heat and incorrect soldering equipment usage or selection may damage the electronics.